Please note that a high-resolution PDF file of the FIAF Manifesto poster can be downloaded HERE. 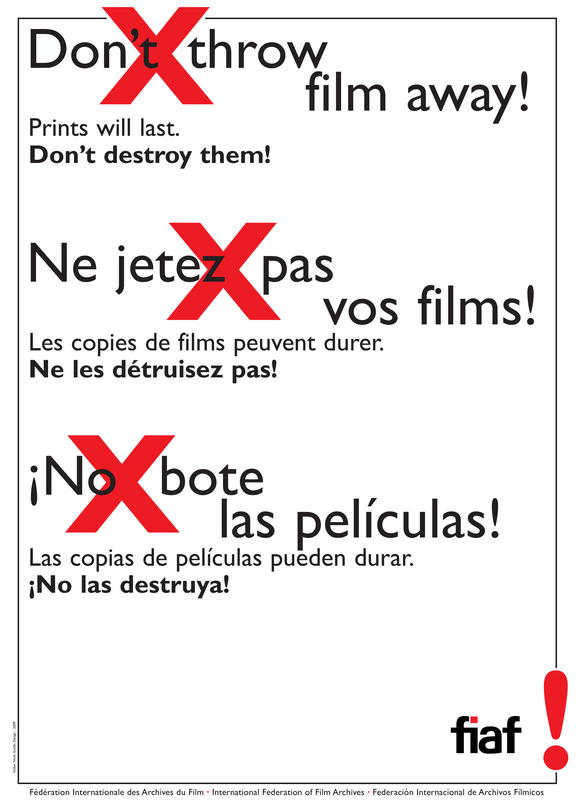 The full text of the FIAF Manifesto is also available HERE in French and HERE in Spanish. Motion picture film forms an indispensable part of our cultural heritage and is a unique record of our history and our daily lives. Film archives, both public and private, are the organizations responsible for acquiring, safeguarding, documenting, and making films available to current and future generations for study and pleasure. The International Federation of Film Archives (FIAF) and its affiliates comprising more than 150 archives in 74 countries have rescued over two million films in the last 70 years. However, for some genres, geographical regions, and periods of film history the survival rate is known to be considerably less than 10% of the titles produced. If you are not sufficiently equipped to keep film yourself, then FIAF and its members will gladly help you locate an archive that is. Film is culturally irreplaceable, and can last a long time, especially in expert hands. While fully recognizing that moving image technology is currently driven by the progress achieved in the digital field, the members of FIAF are determined to continue to acquire film and preserve it as film. This strategy is complementary to the development of efficient methods for the preservation of the digital-born heritage. FIAF affiliates urge all those who make and look after films, whether they be professionals or amateurs, and the government officials in all nations responsible for safeguarding the world cinema heritage, to help pursue this mission. • A film is either created under the direct supervision of a filmmaker or is the record of a historical moment captured by a cameraman. Both types are potentially important artefacts and part of the world’s cultural heritage. Film is a tangible and “human-eye readable” entity which needs to be treated with great care, like other museum or historic objects. • Although film can be physically and chemically fragile, it is a stable material that can survive for centuries, as long as it is stored and cared for appropriately. Its life expectancy has already proved much longer than moving image carriers like videotape that were developed after film. Digital information has value only if it can be interpreted, and digital information carriers are also vulnerable to physical and chemical deterioration, while the hardware and software needed for digital interpretation are liable to obsolescence. • Film is currently the optimal archival storage medium for moving images. It is one of the most standardized and international products available, and it remains a medium with high-resolution potential. The data it contains does not need regular migration, nor does its operating system require frequent updating. • The film elements held in archive vaults are the original materials from which all copies are derived. One can determine from them whether a copy is complete or not. The more digital technology is developed, the easier it will be to change or even arbitrarily alter content. Unjustified alteration or unfair distortion, however, can always be detected by comparison with the original film, provided it has been properly stored. Never throw film away, even after you think something better comes along. No matter what technologies may emerge for moving images in the future, existing film copies connect us to the achievements and certainties of the past. 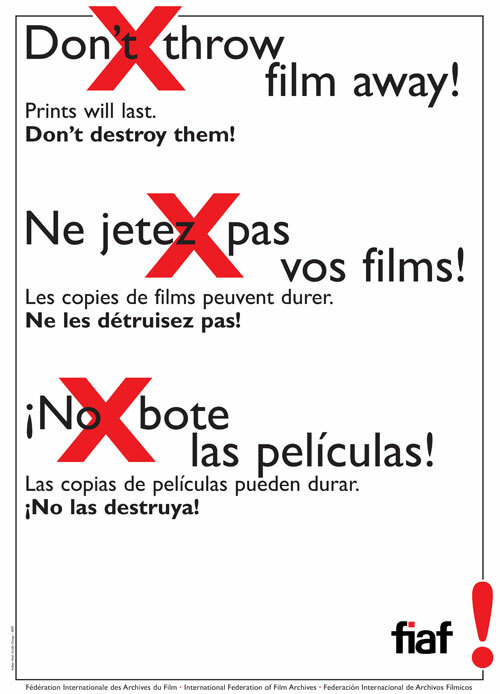 FILM PRINTS WILL LAST – DON’T THROW FILM AWAY. The FIAF 70th Anniversary Manifesto was originally drafted as the FIAF Appeal by Hisashi Okajima in 2007, based on his inspiration first suggested in 2005 in his mission statement for Executive Committee membership of FIAF. The draft was thoroughly refined by David Francis, fully elaborated and edited by Roger Smither, with invaluable advice from Paolo Cherchi Usai, Robert Daudelin, Edith Kramer, and Paul Read, and with the consultation of the current EC members of FIAF. Translation into French was done by Robert Daudelin, and into Spanish by Christian Dimitriu. The Manifesto was adopted in principle by the majority of those attending the FIAF General Assembly in Paris, after discussion that included a number of reasonable suggestions for improvements. As agreed in the proposal that was put to a vote, these have been discussed by a team appointed by the Executive Committee, which has produced this final text. The team consisted of Paolo Cherchi Usai, Roger Smither, Hisashi Okajima and Eva Orbanz. Contributions to the final editing process were also received from Ivan Trujillo, Alexander Horwath, and Maria Bustamente.